The global stuffed & plush toys market is expected to witness significant demand attributed to surge in the number of events. With the growing demand for comfort and soft toys, manufacturers are increasingly concentrating on producing stuffed toys with cotton, sponge and fur clothing. Growing prevalence of various diseases such as Alzheimer’s disease is further likely to contribute towards growth of the global market. As stuffed toys manufactured with fur can capture germs and bacteria and propagate various diseases, manufacturers are increasingly focusing on producing the stuffed & plush toys with fabric materials. The report reveals an in-depth insight on crucial aspects of the global stuffed & plush toys market and further provides information on related to the competitive landscape, factors fuelling growth of the global market, important segments and growth patterns. Growth of the global stuffed & plush toys market is mainly bound by various micro-economic and macro-economic features. The report reveals that the global stuffed & plush toys market is mainly driven by increasing number of occasions and events such as birthdays, Valentine’s Day, Christmas and New Year. Growing need for offering gifts in various occasions and events is expected to fuel demand for the stuffed & plush toys market. Manufacturers operating in the global stuffed & plush toys market are increasingly producing festive toys for various occasions. Increasing demand for gifting stuffed & plush toys for various occasions is expected to rev up demand globally. As preference for watching the puppet shows continue to increase, demand for the stuffed & plush toys is expected to remain high. These factors will continue to fuel growth of the global stuffed & plush toys market significantly. Prevalence of neurological diseases is further expected to impact growth of the global stuffed & plush toys market. As toys help the Alzheimer’s patients feel relaxed and happy, demand for the stuffed toys will continue to increase in the global market. Stuffed & plush toys help the neurological patients to regain childlike behaviors, which helps in stimulating their memory globally. The neurological patients can recover comparatively faster with the stuffed & plush toys. Bound to these factors, sales of the stuffed & plush toys will continue to remain high in the global market. In the next section, the global stuffed & plush toys market is mainly segmented into product type, sales channel, stuffing materials and region. On the basis of product type, the global market is segmented as cartoon toys, traditional stuffed animals, battery operated, action figures & model play, dolls & playsets, customizable stuffed animals and special feature plush and puppets. Based on sales channel, the global market is segmented as hyper/super market, e-commerce, toy stores, discount stores, hobby and craft stores and other sales channels (electronics and video stores, gift shops). By stuffing material, the global market is segmented as synthetic toy fillings, natural toy fillings, eco friendly toy stuffing, organic toy stuffing and blended materials (synthetic and natural mixed materials). Key players in the global stuffed & plush toys market are Mattel, Hasbro, Bandai, Simba-Dickie Group, GIANTmicrobes, Build-A-Bear Workshop, Inc., Lego, Spin Master Ltd, Budsies and Ty Inc.
With the growing population of children, demand for the stuffed & plush toys will continue to increase in the global market. Increasing demand for comfort and soft creature toys has led the manufacturers to opt for sponge, fur clothing and cotton for the production of stuffed toys. Prevalence of various disease and illness is further expected to impact growth of the global stuffed & plush market positively. Manufacturing companies are increasingly focusing on product development and innovation in synch with the imposed regulations in order to gain a competitive edge over other market players. According to Persistence Market Research, the global stuffed & plush toys market is expected to represent a value of over US$ 11,000 Mn by the end of 2026. Demand for the stuffed & plush toys is mainly bound to surge in the number of occasions and events globally. Birthdays, valentine’s day, Christmas and new year are some of the occasions that will continue to boost sales of the stuffed & plush toys in the global market. With the increasing number of traditional occasions, manufacturers are focusing on offering festive toys in the global market. Moreover, increasing number of puppet shows is expected to rev up sales of the stuffed & plush toys in the global market. Stuffed toys that are manufactured with fur have the tendency to capture germs and bacteria. As the stuffed toys are becoming a breeding ground for bacteria and germs, demand for toys manufactured with fabric material is expected to rev up sales significantly. Moreover, manufacturing companies are increasingly focusing on offering toy products manufactured with natural filling. Bound to these factors, demand for the stuffed & plush toys market is expected to remain high during the forecast period. Growing prevalence of neurological diseases will continue to impact growth of the global stuffed & plush toys market significantly. Stuffed & plush toys helps the patients of neurological diseases such as dementia and Alzheimer’s disease to regain childlike behavior, which helps in improving their memory. Moreover, stuffed & plush toys also help the neurological patients to feel relaxed and happy, which in turn improves their chances of recovering. Increasing demand for stuffed & plush toys among the neurological patients will continue to contribute towards growth of the global market. Increasing collaborations and product launches will continue to impact growth of the global stuffed & plush toys market positively. As manufacturers are mainly focusing on product innovation and development in order to offer products equipped with safety and advanced features. With increasing availability of the stuffed and plush toys that are equipped with advanced features such as GPS trackers and sensors. Through these features the guardians or parents can conveniently children and infants. In order to gain a competitive edge over the other market players, the manufacturing companies are entering into collaborations to offer innovative products. However, growing need to comply with various compliances is expected to impact growth of the global stuffed & plush toys market significantly. Several federal and state regulations imposed has led to stringent checking of the stuffed & plush toys before the launch. Moreover, imposition of safety regulations by the Federal Trade Commission regarding the safe manufacturing of the stuffed toy products is likely to boost sales globally. These factors are expected to contribute towards growth of the global stuffed & plush toys market. As preference for playing with stuffed toys increases, demand for the dolls & playsets is expected to remain high in the global market. On the basis of product type, the dolls & playsets segment is expected to represent the highest revenue growth, accounting for a value of over US$ 900 Mn by the end of 2026. On the other hand, the special feature plush and puppets product type segment is expected to register a robust CAGR during the forecast period. Based on sales channel, the hyper/super market segment is expected generate significant revenues, recording a value of over US$ 500 Mn by the end of 2017. However, the other sales channel (electronic and video stores, gift shops) segment is expected to register a healthy CAGR through 2026. By stuffing materials, the synthetic toy fillings segment is expected to witness robust revenue growth, accounting for a value of over US$ 1,100 Mn by the end of 2026. In contrary, the organic toy stuffing materials segment is expected to register a significant CAGR throughout the forecast period. 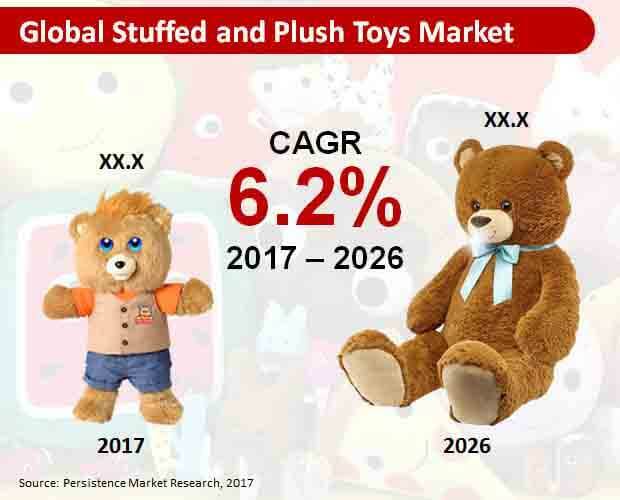 Leading market players operating in the global stuffed & plush toys market include Mattel, Bandai, Lego, Hasbro, Simba-Dickie Group, Spin Master Ltd, Budsies, GIANTmicrobes, Build-A-Bear Workshop, Inc. and Ty Inc.